Customers buy these products with the Gentell Wound Cleanser 8 oz. The BARDIA Closed System Indwelling Catheter Insertion Tray gives you all the components for a complete sterile catheterization procedure. Closed system includes a pre-connected drainage bag. 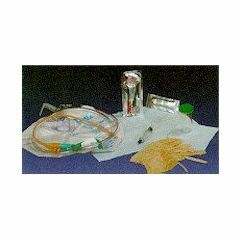 The Tray includes pre-attached 2000 ml urine drain bag, pre-filled 10cc inflation syringe (sterile water), 3 povidone-Iodine swabsticks, lubricated jelly packet, graduated specimen container with labels, CSR Wrap, gloves, fenestrated drape and waterproof underpad. Latex, silicone elastomer coated catheter w/5cc balloon. I would buy the 30cc bulb the next time. Long term incontinence. Following Surgery. Used mostly for night time and travel. Easy Storage. Safe. Sturdy. Lightweight. Very complete set. Very easy to use- no problems with leaking or drainage. Will definitely buy again.